Buy New Appliances and Save Money! Yes, I am saying to buy new appliances and save money. Recently, I bought a new refrigerator to replace a nineteen (19) year old refrigerator. It was freezing up and leaking water from the freezer. It just didn’t make sense to repair because of the age and we wanted a stainless steel one to match relatively new dishwasher. I hate shopping for appliances! Shopping for appliances such as refrigerators, washers or dryers is not fun! Where do you go, what brand is best, never mind what size do you need? If you believe the marketing hype, you need every little bell and whistle. I started with Consumer Reports to provide an objective analysis. I noticed immediately that two (2) of the brands I was interested in were in the top three (3) rated appliances. This was not my only research, but it part of it. Next I went on the internet to try to figure out what we wanted. Size does matter! Our old refrigerator was bought when my children were still living with us. Therefore, I thought we could get away with something smaller. Silly me! There are only so many models and they seem to be larger than ever before. We had a twenty-four (24) cubic inch refrigerator and bought a twenty-six (26) cubic inch one. So much for downsizing! The store we went to told us about energy rebates from the utility company which I mentally deducted from the cost. My wife and I wanted a French door, stainless steel refrigerator without the water/ice through the door, but we ended up with a side by side with water/ice through the door. So much for research and a list of what you want. We changed because the bottom freezer was inconvenient, although there were baskets and compartments. The upper portion seemed small no matter the size. What was the tipping point? Price as usual, the differential was $500! We could not justify the difference in price for the look and questionable functionality. The real eye opener was the price, not the differential but how it compared with what I spent nineteen (19) years ago. Our broken refrigerator cost roughly only 20% less than the new one. The new one was larger and stainless steel. If I subtract the rebate, the new refrigerator was cheaper. Without accounting for inflation, the two (2) refrigerators were very similar in cost! The biggest surprise was when the recycling company picked up the old refrigerator. One of the guys told me that the annual cost of operating the old refrigerator was $350. If I knew that sooner, I would have replaced it years ago. I already knew the new refrigerator would cost $53 in utility costs per year. These differences are not just for refrigerators. Other appliances such as dishwashers, washing machines and dryers are much more efficient today than ten (10) or twenty (20) years ago. Just add it up, $350 times ten (10) years is a lot of money. Based on the utility difference alone, my purchase will breakeven in less than four (4) years. That is a great payback; just ask your favorite engineer or accountant! All this was more than enough to encourage the purchase. Then the store offered no interest for a year. I have the cash, but I will gladly take the free money for the year. I did this before when I bought a PC from Dell. I set up an automatic payment monthly to insure it was paid off on time. What is the takeaway from this experience? When you think about your expenses, you should think outside the box. Do you consider utility costs for appliances as a reason to replace them, but you should? Not only would you save money, but you could enjoy a better, newer product for less. My purchase will breakeven in less than four (4) years. As a former CFO, I use to examine these issues in companies all the time, but never in my personal life. I usually wait until it either breaks down or it is no longer useful. What do you think? Yes, I am saying to buy new appliances and save money. The biggest problem is the up front cost of doing this. Many people just don’t have the cash lying around to front this purchase. If you finance it, you take away much or all of the savings by paying interest. Most people could probably stand to apply this principle to their fridge, dishwasher, washer, furnace, air conditioner, and hot water tank. They’d save hundreds per year in energy costs but shelling out the dough for all that is prohibitive. The key to this is planning! I knew my 19 year old refrigerator was going for over a year. I started watching for sales and incentives before it actually was replaced. I also started adding to savings to cover the cost. In the end, I took advantage of the no interest financing for a year. A little planning goes a long way. Yes, as Krantcents says, many times interest-free financing is offered. Just be triple-sure to pay it off in advance of the deadline, with a margin for error, with all minimums paid on time. Then interest-free financing is a good deal. I’ve taken nine months to pay for a computer this way and it worked superbly. Good job saving operating costs and getting a sleek, new appliance in the process! Online banking to pay bills is great for this. I just set up my monthly payments and I decided to pay it off in 11 months just to be safe. I did the same thing when I bought my PC. I believe in buying a more eco friendly product but if I don’t need to replace something yet I won’t because that isn’t green either. There are too many new items that end up in landfills. Good for you on your new purchase though. After 19 years I think it was due. The recycling company that picked up the old refrigerator told me they recycle everything and dispose of the old freon appropriately. The bonus was the rebate from the utility company! I probably should have replaced it sooner to get the benefit of the lower utilities. Brilliantly written. According to me there are few noteworthy factors that should be taken care of before buying new appliances. Being a college student I didn’t have so much idea regarding this topic. But as far I know, going for older models is any day better than the newer ones. Rest of the points that you have mentioned above are really going to be helpful for me in future. Thanks a lot for sharing. Older models, as long as new, can be a lower cost. Used cars are different depending on the popularity. Low MPG seems to command a premium in used cars and less depreciation. We are definitely replacing our appliances when we remodel our kitchen. Our power company gives us a small rebate and will actually pay us to haul the old one away… I am guessing there is some value in scrapping it. If the electric cost is really that different I may look into replacing it sooner! If I believe the recycling guy, it is pretty high. I am looking forward to my next utility bill to find out, although I have been using the air conditioner lately. I agree a new appliance can be costly but can help you reduce your electric bill. But a faulty selection can drain your pocket. Always try only the trusted brand in the market. I was really surprised how little prices have increased over 19 years. You still have to shop carefully and look for bargains, but I am surprised how quickly I will repay the cost. I also agree that buying new can save you a ton of money in the long run – especially on utility costs. If you are replacing multiple appliances, make sure you ask about special discounts. When I purchased a house a few years back, there was no appliances. By buying everything from the same vendor (dish washer, refrigerator, microwave, stove) I saved close to a $1000 in rebates and special discounts. They also had 0% interest for a year, so it was a great deal. I have seen the package pricing in the newspaper. It is just perfect for a new home where there are no appliances or replacing all of them at the same time. This large difference in running cost came as a surprise to me at first as well. Now all appliances have been changed and we buy the ‘greenest’ ones – it is worth it and not only in terms of our pocket. I guess appliances have made huge strides vs. automobiles in the same length of time. small changes to make our planet greener has a huge effect. A little recycling or energy savings matters a great deal. The energy savings makes me realize it is good for my financial well being too. Bought a new fridge this year after we moved. Our icemaker broke twice so far. I’m not crazy about the repairs (luckily it’s under warranty). Don’t know if I saved any money because utility costs are high here. Although new appliances are far more economical, it seems that that do not last as long. Something to look forward to, I guess. I hope the naysayers are wrong. things do apply for appliances but not for everything mechanical, example, your car. I will ask my landlord to replace the AC, for last few months we are getting big energy bills. I bought my car for almost the same price as my old (17 y.o.) one. Yet the new car is much nicer and more efficient. Many electronic products are less expensive than the older ones and you get more for the money. You’re right it may not be true for everything, but it covers appliances and similar products. We replaced our 15 year old dishwasher last year with a new Bosch model. I replaced the pump motor myself and probably extended the life by 5 years. By financing the new dishwasher with a zero interest account with Best Buy we saved a few bucks on interest as well. Was there any rebates from the utility company? You probably saving on water, the newer models use less water. Great message. I would probably have held on to an old frig for longer in hopes of avoiding a big expense. I now see I have to go bigger picture with the utility expense side of the story. Can we also add health benefits? Newer equipment runs more efficiently, less emissions, and probably has less bacteria. I have no idea if there are health benefits, but saving money in utility costs is certainly beneficial to one’s financial health! At times you may have to pay a little more than you did 5-10 years ago for the same appliance, but buying these new items can end up paying for themselves, saving not only money but also energy and carbon footprint! Take a solar panel for example. The irony is the cost was similar to what I paid 19 years ago. 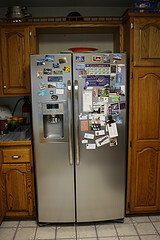 Appliances are similar to electronics that become cheaper and more feature rich over time. The utility savings is a huge bonus!